Will climate change impact your bottle of bubbly? Champagne growers move toward sustainability. At a time when it seems the global fight against climate change is more urgent than ever, the Champagne region of France remains committed to sustainable development in winemaking. The houses and growers of Champagne are actively engaged in innovative techniques and initiatives to reduce their carbon footprint and mitigate environmental harms related to climate change. 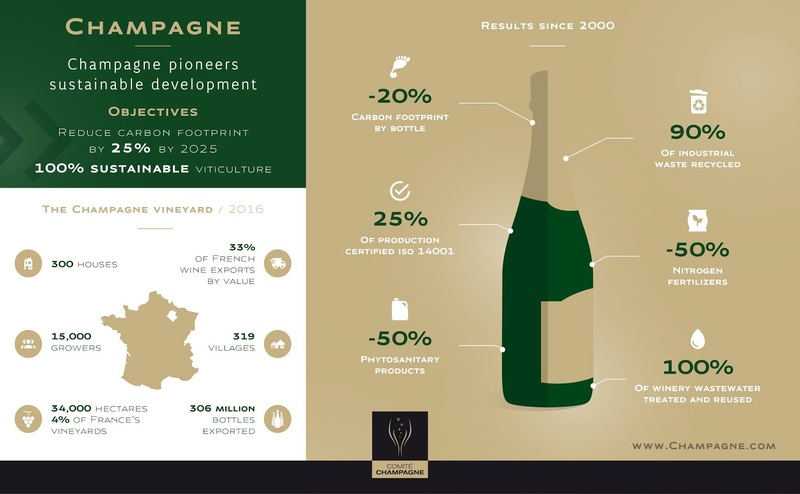 With Earth Day around the corner, pop a bottle of bubbly and check out this information about sustainability efforts in Champagne. Global warming is a local reality for Champagne. As you may have heard, the 2018 harvest season was the fifth time harvest began in August in the last 15 years. While great for grape yields, bumper harvests also signal a changing climate that winemakers must adapt to. Champagne’s sustainability goals include lowering its total carbon footprint 75 percent by 2050 and using zero herbicide products by 2025. One hundred percent of Champagne vineyards have committed to continuous improvement and there is optimism that these goals are attainable. More than 20 percent of the Champagne vineyards have already been environmentally certified, and 15 percent are certified in sustainable viticulture. This number is expected to grow as the region works toward reaching the goal of 100 percent environmental certification by 2030.